I was planning to just fill the vertical 'sausages' with wool fleece which I can get fairly cheaply by the kilogram at a local knitting shop who gets fleeces practically straight off the animal's back. 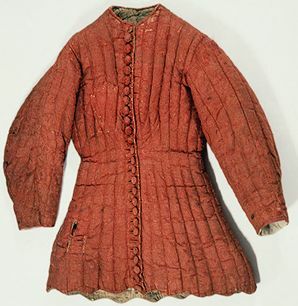 I was wondering if anybody had made a gambeson in this manner and whether you had any problems with the wool 'sagging' down the tubes as the garment is used and finally collecting at the bottom so that after a while there is no stuffing left in places like the shoulders for example. You don't fill the sausages. You stuff the garment like a pillow and then you do the vertical quilting. The stitches go through the stuffing. The only way this armour can provide any kind of decent protection is if the stuffing is very heavily compressed. It would start out more than a hand thick and be compressed down to a finger or two after quilting. 1) Multiple layers of linen as in 20-30 of them which sounds expensive and likely to be a pretty stiff garment. 1) Sewing the linen or leather up and then stuffing the 'sausages' with wool or fabric scraps. 2) Doing what you suggested, sandwiching un-spun wool between linen or leather outer layers and sewing through the wool. 3) Multiple layers of wool fabric (read: old blankets) sandwiched between outer layers of linen or leather. The problem with option 1 is that the "gaps" between the "sausages" then consist of exactly 2 layers of fabric, which is not as protective as the other two options. Pray tell, what are you are hoping this garment to be? Are you trying to make stand alone cloth armor or padding materiel for plate or mail? Also, what are your time and budget concerns? What are you planning on using this gambeson for? Finally, that gambeson look it would horrible for arm mobility, it looks like it cut like modern t shirt. The surviving pourpoint of Charles VI has "sausages" of cotton layed down on a fabric base, with a second layer of fabric sewn over them. In other words, the stiching doesn't run through the loose fiber at all. Then again, it is made from two layers assembled in this fashion, so with the covering red fabric, there are at least 5 layers of cloth in the un-padded part. P.S. I notice the image which I obtained from a Pinterest page is mirrored. The overlap should be left over right, and the slits for the dagger or sword should be on the left. The loudel of Dom João I, King of Portugal uses wool flocks for stuffing, If I understand correctly, but I don't know if the wool was stitched through or not. I wouldn't be surprised to find such armors with a variety of names to have been made in a variety of ways. I think that would answer his question about loose fibers migrating. This was used and is centuries old surving piece, the designed had migration problem, is would of happened by now. Certainly the method of storage could become an issue. In miniatures we see armor draped over a pole, rather than hung by the shoulders. Inventories list things being stored in various chests, sacks, and baskets. The problem here is there is a multitude of methods and sources but sadly not enough concerning any one type to draw empirical answers. They were made in all sorts of ways for all sorts of functions throughout the middle ages. I've made them tubular and quilted. The latter works far better and is an easier garment to wear and work in. To prevent fibres migrating in the tubular version you have to staff pretty hard, almost until its so still its inflexible. But those have to be of several layers of cloth, not just two, as even a nick from a thorn bush will leaving you leaking stuffing and compromised. I have one with both methods, tubular outer and quilted inside, works very well and is based on no evidence whatsoever. but it works as a bit of historical PPE and that was its aim, to protect me whilst allowing me to work. Its basically two garments sandwiched together. I'll make s this point for the zillionth time, wjhen discussing arms and armour over modern reconstructions as i think it has a bearing. Our forebears had one advantage over us when wearing garments like this. They could kill the person in front of them. We have to go to work on Monday morning so make things thicker and stronger than they probably were originally. Certainly true where plate armour is concerned and pretty sure that goes for stuffed/layered, quilted etc is concerned. It's why some Brigandines that are made are nearly twice the weight of surviving originals. Good point, I am planning to use the it mostly as an under amour gambeson to wear under a round rings riveted mail shirt. Along with that as a side project I need a padded cap to wear under a helmet I have that has no leather lining. For the the cap I think it would be best stuffed with wool fleece like the one that shipped with my helmet seems to be but the original cap is a bit too small for me and I'd like to add a padded neck guard. The chain mail aventail seems to give limited protection against a blow to the neck unless there is padding underneath it. However, for the neck guard I think I may use multiple layers of wool blanket rather than stuffing it with fleece.